For the last year, I’ve lived very comfortably on the absolute edge of Western Civilization, approximately 1.5 miles to the North Korean border. When I say, “I can see North Korea from my backyard,” this isn’t a metaphorical statement. During my first visit to English Village, the razor wire, armed guards, and occasional tank along the Han River were a bit jarring. But as time went on, I began to overlook the heavy fortifications, as the more-pressing matters of day-to-day life came to the forefront of my mind. My life was in South Korea, in a posh, suburban area near Seoul, the world’s second largest metropolis. However, I could never fully shake the thoughts of North Korea out of my head. It was there, just across the river. I’ve not taken a single bus ride into Seoul where I’ve not craned my neck to look at the quiet, green hills in the distance. Unlike the vast majority of the locals, I cannot stop myself from looking and wondering about what is happening in that sheltered, mysterious land. 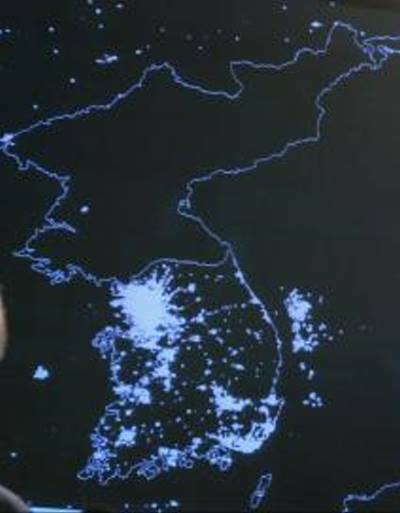 When I return from Seoul at night, I still look off into the distance where North Korea should be. Of course, I see nothing. Those same green hills are blanketed by the night, without the benefit of electricity to illuminate the propaganda village on the opposite banks of the Han. The darkness is so complete, that I might as well be looking out at the ocean. Still, I look and wonder from the comfort of my modern, comfortable, climate-controlled bus as I speed off to my safe home at English Village. About six months ago, a couple of friends and I started a tradition of climbing the hill behind our campus to watch the sunset over North Korea. We share a few beers, stories of the day, and often random pressing complaints from our workplace. There is a massive disconnect between our insignificant problems and the very real ones just over the border. Last night, we climbed the hill and watched what was, to date, the most impressive sunset we’ve seen. In fact, it was one of the most beautiful sunsets I’ve seen anywhere. Neither words nor pictures do it justice. The sky was vibrant with bright reds, oranges, yellows, deep blues, and purples. 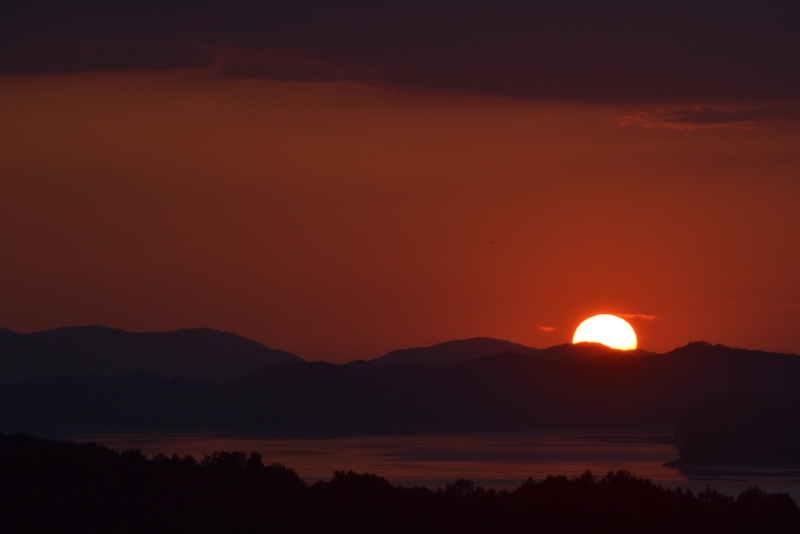 As the sun finally dropped behind the North Korean hills that dot the horizon, dusk settled in, and we caught a glimpse of a small, nearly imperceptible, flickering point of light. Was it a fire? What were they doing across the river? Were they looking back at us, wondering what life was like in this sea of light and life? Soon, that small light was also consumed by the darkness, and the land that had seemed close enough to touch moments before disappeared for another long night. We left the hill soon thereafter. There was nothing left to see, and the mosquitoes began to attack in earnest. Less than two miles away, the residents of that sad country would have no such luxury. Mosquitoes would pester them throughout the dark, unseasonably cool and damp night. And these were the lucky North Koreans, if such a term could be justly applied. If I could see farther into the void, I would see some of the estimated 200,000 prisoners struggling to merely exist in the extensive network of labor camps spread throughout the nation’s interior. They are out there tonight, sleeping on concrete floors with stomachs that are perpetually hungry. Many of them, the ones born inside the camps, don’t even know about the other Korea, to say nothing of the rest of the world. In the book Escape from Camp 14, Shin Dong-hyuk, the only person born inside a prison camp known to have escaped, recalled learning that the world was round in his early 20s from a new prisoner. The control over the prison population is total and complete. When I was traveling through Russia in the summer of 2006, I visited Perm-36, the last remaining gulag from the Soviet regime. The KGB could not dismantle it before the collapse, and now it stands as a museum. It operated until the late 1980s, a fact which affected me on a very personal level. Political prisoners, whose only crime was (rightfully) opposing a corrupt state, were working, suffering, and dying at this sad outpost during my lifetime. It was May when we visited, but these concrete barracks were still frigid. What was it like in the depths of a Russian winter? As sad as a place like Perm-36 is, it can no longer destroy lives. It is in the past. The same cannot be said about the atrocities being committed in North Korea at this very moment. Lives are still being destroyed, both in the camps and throughout the rest of the country. The problem with looking into the darkness is seeing what one would rather ignore or be willfully ignorant of. The juxtaposition of English Village in the foreground and North Korea just beyond it is stark. I want to go across the river and help, but I am completely powerless to do anything. The political unrest between the Koreas is always simmering on the back burner, and as South Korea continues to increase its wealth, it seems to care less and less about its suffering brethren. In a way, I cannot blame them. When the head of state of North Korea is a dead person (or a “Necrocracy” as Christopher Hitchens put it), well, even simple matters can be difficult to negotiate. Even if a magic wand could be waved and the countries were reunited, how would the two halves survive with such enormous disparities between wealth, infrastructure, standards of living, and culture? The challenge is almost too big to contemplate. I have no answers to this problem, nor do I know of anyone who could reasonably claim to. The only thing I can do is raise awareness, and to try to shed some light on the darkness. I hope in a small way, this does precisely that.